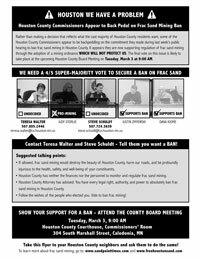 Rather than making a decision that reflects what the vast majority of Houston County residents want, some of the Houston County Commissioners appear to be backpeddling on the commitment they made during last week's public hearing to ban frac sand mining in Houston County. It appears they are now supporting regulation of frac sand mining through the adoption of a mining ordinance which will not protect us. The final vote on this issue is likely to take place at the upcoming Houston County Board Meeting on Tuesday, March 3 at 9:00 AM. We are so close - Help us see this through! Seeing the packed room at last week's public hearing was one of the powerful attributes that helped sway the Commissioners — thank you all — let's keep that momentum going! 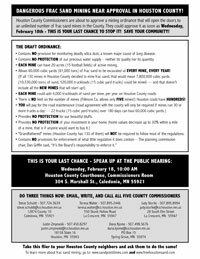 Please be sure to thank them for their votes at last week's public hearing - Tell them you support a ban on frac sand mining in Houston County. Urge Your Houston County Friends and Neighbors to Attend The March 3 Meeting and to Contact Teresa Walter and Steve Schuldt! Contains NO provision for monitoring deadly silica dust, a known major cause of lung disease. • Contains NO PROTECTION of our precious water supply – neither its quality nor its quantity. • EACH MINE could add 4,000 truckloads of sand per mine, per year on Houston County roads. • There is NO limit on the number of mines (Fillmore Co. allows only FIVE mines!) Houston could have HUNDREDS! • Provides NO PROTECTION for our beautiful bluffs.